I've covered a lot of various pieces of software that are designed to help you do scientific calculations of one type or another, but I have neglected a whole class of computational tools that is rarely used anymore. Before there was the electronic computer, computations had to be made by hand, so they were error-prone. To try to minimize these human errors, shortcuts and aids of one form or another were developed. A common computational problem is to solve equations of some number of variables. The tool that was developed for this class of problem is the nomograph, or nomogram. A nomograph uses a graphical representation of an equation to make solving the equation as simple as setting down a straightedge and reading off the result. Once a nomograph is constructed, it is one of the fastest ways to solve an equation by hand. In this article, I explore some common nomographs that many of you likely will have seen, and I take a look at a Python package, PyNomo, that you can use to create your own. I also walk through creating some new nomographs, which hopefully will inspire you to try creating some too. First, let me explain what a nomograph actually is. 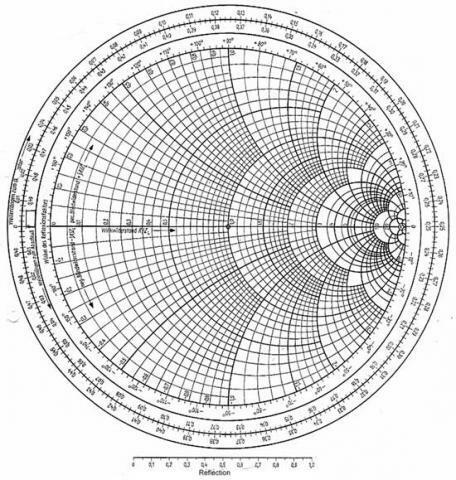 Electrical engineers already should have seen and used one example, the Smith chart. This chart provides a very quick way to solve problems involved with transmission lines and matching circuits. Solving these types of problems by hand was a very tedious task that wasted quite a lot of time, so the introduction of the Smith chart increased productivity immensely. Figure 1. With a Smith chart, you can work on problems around transmission lines and circuit matching. A Smith chart is scaled in normalized impedance, or normalized admittance, or both. The scaling around the outside is in wavelengths and degrees. The wavelength scale measures the distance along the transmission line between the generator and the load. The degree scale measures the angle of the voltage reflection coefficient at that point. Since impedance and admittance change as frequency changes, you can solve problems only for one frequency at a time. 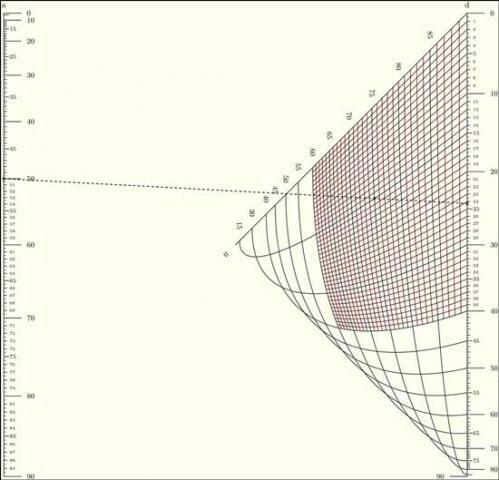 The result calculated at one frequency is a single point on the Smith chart. For wider bandwidth problems, you just need to solve for a number of frequencies to get the behaviour over the full range. But, because this isn't meant to be a lesson in electrical engineering, I will leave it as an exercise for the reader to see just how many other problems can be solved with a Smith chart. Another example, which should be recognizable to any parent, is the height/weight charts used by doctors. These charts allow a doctor to take the weight and height of a child and see where he or she fits on a nonlinear scale that compares one child to the available statistics of a population very quickly. This is much easier than plugging those values into an equation and trying to calculate it manually. Figure 2. A simple nomograph is a Celsius-Fahrenheit temperature conversion scale. Figure 3. You even can do something as complicated as celestial navigation with a nomograph. Once this nomograph is constructed, you can use it to compute the altitude azimuth. scale paper: scale the nomograph to the size defined by paper_height and paper_width. rotate: rotates the nomograph through the given number of degrees. polygon: applies a twisting transformation to the tops and bottoms of the various scales. optimize: tries to optimize numerically the sum squared lengths of the axes with respect to paper area. With these transformations, you should be able to get the look you want for your nomograph. Now that you know about nomographs, and even more important, how to make them, you really have no excuse to avoid your trip to that isolated South Pacific island. Go ahead and play with PyNomo and see what other kinds of nomographs you can make and use.